Home » Comics Reviews » Mera: Queen of Atlantis #1 Review! Mera: Queen of Atlantis #1 Review! Written by: JediJondee46 on March 4, 2018. We had a glimpse of Amber Heard’s Mera in the Justice League movie. Mera returns in James Wan’s Aquaman film on December 21st. She had just taken part in Aquaman’s return in his title with the “Crown Comes Down” storyline. Mera pierced the sorcerous Crown of Thrones barrier around Atlantis with a faulty amulet. In Aquaman #30 she discovers it is at great cost because she can no longer breathe underwater and is dying. Still, Reverend Mother Ceta of the Widowhood has named Mera as queen of Atlantis. Aquaman led a rebellion against King Rath to save Mera’s life and bring her to the Amnesty Bay lighthouse and life saving air. Aquaman returned to Atlantis to take down Rath. 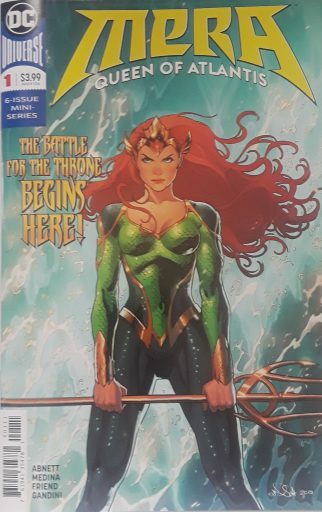 The first issue of the six issue limited series features a cover by Nicola Scott with Mera in her green armor with the trident in front of a wave. Mera forms a shield, but it is shattered by his blasts. It is noted that Mera could easily defeat him, but she is still recovering. The Eel knocks down Mera and gets her in a choke hold to throw her into the sea. He pursues her into the sea water and again chokes her. Mera flashes back to Arthur’s proposal, her time with Aquaman with some orcas, and then facing him for the first time on her mission to kill Aquaman. She flashes back further to Xebel, her former home, where she is trained by Master-at-Arms Leron. He trains her to fight and she uses her Aquakinesis to form a sword. Leron gets Mera in a chokehold. This of course shifts to the Eel doing the same. She uses her powers to attach to the Eel, he uses his powers to slip away, and slams him into some timber. Tula, who was Aquagirl, runs out to find Mera. She drags the Eel’s unconscious body to the dock and calls in the Justice League. Superman and Wonder Woman appear to ask about the Eel. Mera suspects it’s Rath who hired the Eel. She also brings the Justice Leaguers up to date in what is happening with Atlantis. Wonder Woman asks if the Justice League is needed, but Mera says the civil war needs to be resolved only be Atlanteans. Tula explains to the Justice Leaguers that Mera is wounded and needs to recover on the surface. This shifts to the State Department in Washington D.C. where Mera goes to talk to the secretary of state. She tries to reassure the government official to stand down and that the situation will be taken care of even after the “Throne of Atlantis” invasion. Mera flashes back to Xebel where she is training. An agreement is worked out with a handshake as long as the war does to reach the surface. She is driven back to the lighthouse and then we get a peek at Orm where he decides to protect his new life at all costs. The flashbacks give a little background to Mera’s story, there is enough action, and a return of Ocean Master! Four Tridents of Neptune out of Five!